Where do you head in the quest of catching up with the latest in fashion? The answer is your social media feed. While pundits have already announced the beginning of the end of fashion magazines and fashion blogging, visual ready reckoners such as Instagram are now sounding the death knell for fashion shows. Internationally too, the growing reach of social media has led many a designer to showcase collections online. Notable among these are Oscar De La Renta. Closer home, ace designer Sabyasachi, who has mastered the art of vintage perfection in his heritage bespoke styles, has taken to the social networking site like a pro. He recently showcased his wedding collection, Sabyasachi Red. At the same time, the exposure and platform that fashion weeks provide is unquestionable. For upcoming designers, it is a sure shot way to find recognition, meet buyers and get business. Pallavi Singh, who showcased her Arcvsh at the recently concluded India Fashion Week, elaborates, “We are not so big to survive by just showcasing on social media. Only established designers can afford to do that. As against the investment made, fashion weeks establish you as a designer. 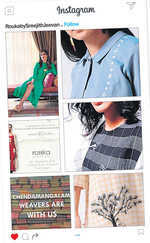 It’s a win-win situation for the designer as stores take samples and call clients at no extra cost.” On the other hand, equally true is the fact that to grab the short attention span of the fashion viewer, designers like Anamika Khanna have experimented with installation mannequin showcasing instead of a ramp walk. So, fashion weeks remain an important way to create a buzz around a line. However, engaging with influencers and social media for brand building is gathering steam, says designer and founder of Kanelle, Kanika Jain. “Social media influencers play a big role in popularising fashion lines. They’re sought after by the designers for popularising designs even during fashion weeks. Working with them helps us reach a more organic audience. I feel social media is not only beneficial for reaching a larger audience, it is also a better way to collaborate with various creative talents,” she says.